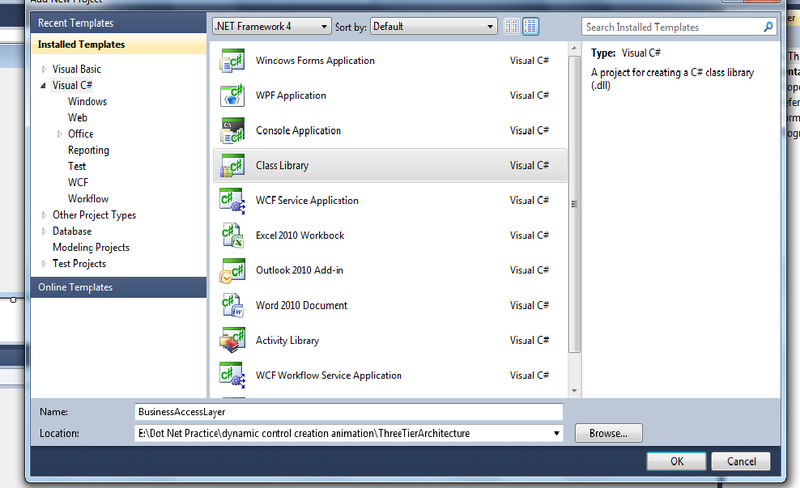 In the Previous article i explained How to Write and Access ConnectionStrings from App.Config settings file, An overview of WPF Architecture.Now i will explain how to create three tier architecture for .Net Application. This is the presentation or User Interface layer to which user will interact. 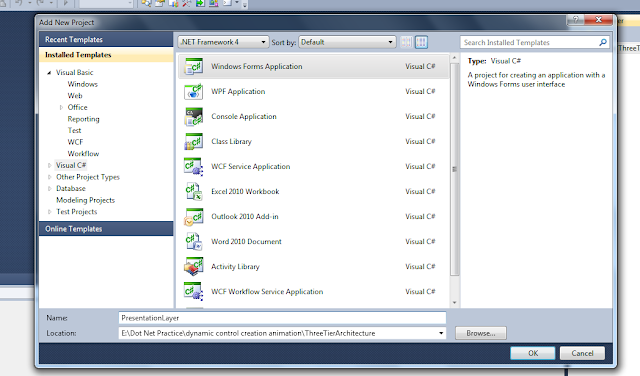 If it is Windows Application then the we have to take the project type either Windows Application, WPF Application Or Console Application. In this layer we will perform some validations on data before sending it to Data Access Layer. This layer is created by taking Project type as Class Library. In this layer we will maintain some objects regarding communication with database. Example SqlConnection ,SqlCommand,Adapters, Readers etc Based on Data Base(Sql Server,Oracle, My Sql etc). 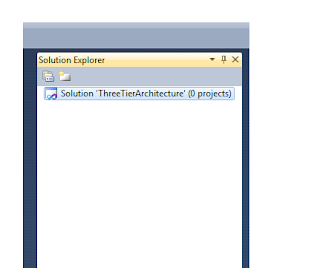 Here is Screen Shots of How to create Three Tier Architecture in C#.Net using Visual Studio. 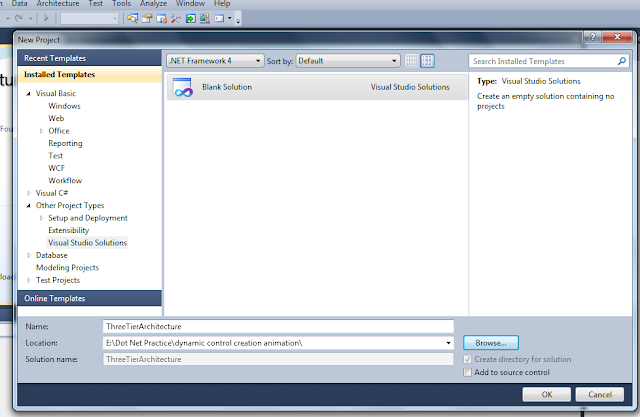 First create an empty solution by going other project types in Installed Templates section. 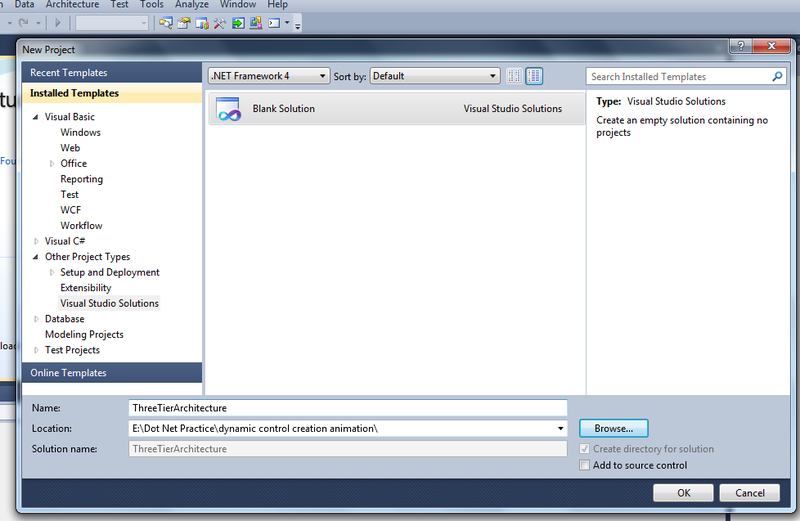 In this select the Visual Studio Solutions, then you will get blank solution then give name for the solution. Now empty solution is created. You will see the solution explorer in following manner. Now Our next task is to create Three Layers as we discussed. First Layer is presentation layer. 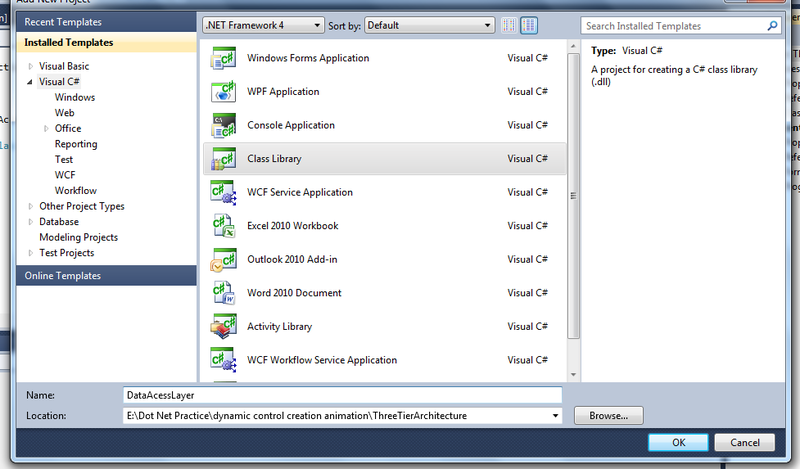 Here we can choose our project type either Windows or WPF Application type or Console Application etc. Give name for Project then Press Ok.
Now we have to create Business Access Layer. Now Business Access Layer done. In the same manner create data access layer. 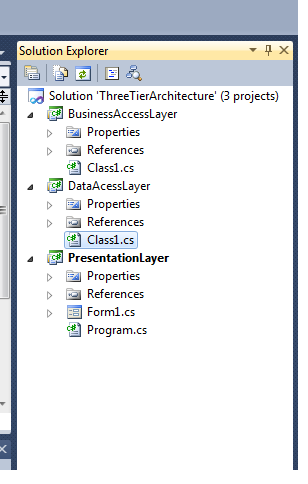 give name as data access layer then press ok.
Now you completed creation three tier Architecture for windows application. In the same manner only you have to create three tier architecture for web also by taking project type as New Website. finally you will see the solution explorer like this. Three tier architecture involves three layers Presentation,Business Access,Data Access Layers. we can use any types of names here. Different people different names for these layer. What ever might be the name but this approach same. 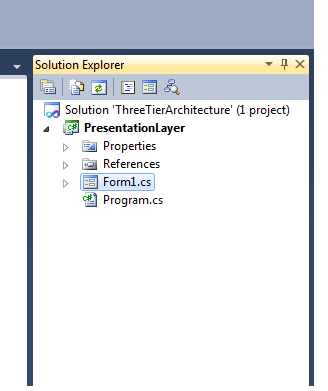 Hope you will get an idea how to create three tier/layered architecture in C#. In the next article i will explain how to consume three layers. I would like to have feedback from my blog readers. Your valuable feedback,Suggestions,Questions, Comments about this article are always welcome. 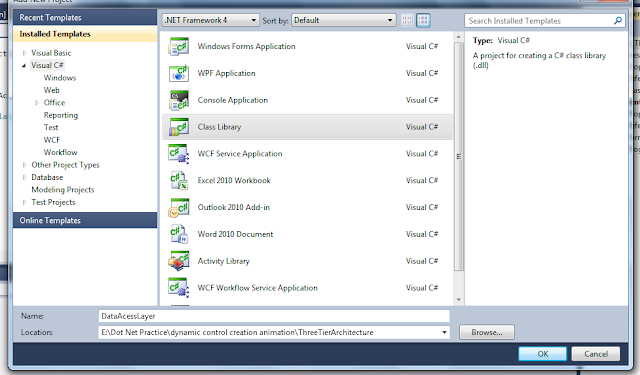 How to work or consume three tier architecture in .Net Application Explanation with Example. Very useful article for the newbies like me. Kindly write the next article on the content to put in these layers. Thanks krishna. Sure i will post how to consume three tier architecture in windows application and web application. Keep visiting.